A 3D pen is really awesome and it is considered as the bulkier version of an ordinary pen or a pencil, the 3d pens use plastic instead of traditional lead or ink. 3D printing pens are fun; it is perfect for artist, kids, and hobbyist. The 3D pen can enhance your creativity that also allows you to understand the three-dimensional objects easily. In general, the 3D printing pens are made by using 2 different technologies. More importantly, the 3D pen work based on heating technology. The heat is strong enough to melt the plastic this also turn it into a liquid, if the process is done then you can start using the pen to write or draw. Of course, 3D pen is effectively works on almost all the surfaces. When it comes to choose the 3D printing pens you have different choices but choosing the right pen is really important to enjoy your activity. Before I proceed further directly to the list of best 3D Printing Pens, I want you to know what exactly is this new technology and what is 3D Pen. What is 3D Printing Pen? Basically, 3D Pens are low-powered, hand-held device which exactly looks like any pen. Basically it uses thermoplastic as the filaments instead of inks which are made of Polylactic Acid (PLA) or Acrylonitrile Butadiene Styrene (ABS) materials which are often used in mainstream 3D printing industries. 3D Pens It allow the user to create free-form models using their imagination and a steady hand. Since it is made considering artistic uses you will find numbers of colorful filaments available in the market at cheaper rates. If you are thinking about what are the uses of 3D Printing Pens then I must say, I would love to use it for just fun. Since this market is pretty new and saturated yet, but in future the possibilities of are unlimited. Here on paper, we can draw objects in 2D form and here we can show things in 3D form. 7Tech 3D Printing Pen is the best choice that allows you to create objects in the air. It is the newest version of 3D Pen works based on newest technology. Even this pen also offer great benefits, especially user have chances to control the speed of the pen manually. Obviously, temperature options also available that includes PLA or ABS filament. This 3D pen highly helps to perform better than others. This pen is highly suitable for 1.75mm ABS or PLA Filament; in addition this pen is come with LCD screen that allows you to read temperature, filament control as well as speed. Moreover, this pen available with button controls that allows you to control extrusion speeds. More importantly, this pen is features an unclogging mechanism to prevent jam, the advanced thermal control help to meet your needs. Super silence design is also offer perfect look. The slender pen body is highly perfect for hands use and the speed of the pen is also changed with single finger. Plastic heats up during the process then cools to a solid shape. In addition with this it has intelligent auto standby mode. The 3Doodler Create is one of the perfect choice to enjoy your activity as well as it is the latest generation of 3D printing pen that offer ultimate benefits, it is perfect for smoother, faster activity. As well as the 3Doodler Create to capture the amazing versatility with this you can easily create fine art, DIY and maker projects. It is ideal for creating scale models and decorative items. It is the stunning printing pen that helps to turn your sketches into amazing 3D sculptures. Obviously, it is slimmer, lighter and stronger when compared to any other model. Even this printing pen is also features enhanced design and drive system that helps to achieve quieter and smoother operation. On the other hand this printing pen comes with dual speed control and a new continuous flow that help for non-stop Doodling, the new nozzle design also offer nice look and it is ideal for better performance. It is the newest versions of Scribbler 3D Pen this pen features unique options as well as people prefer this pen for its awesome design. In general, this pen come with big LED Screen, there are different color options also available with this you can choose your favorite option. This 3d printing pen help to enhance your creativity, with this pen you can easily create 3D art and objects with ease. Scribbler 3D Pen replaces ink with plastic and plastic is also melt due to the high temperature that help to draw in the air. Of course, melted Plastic cools down very fast that helps to make whole drawing process safe. 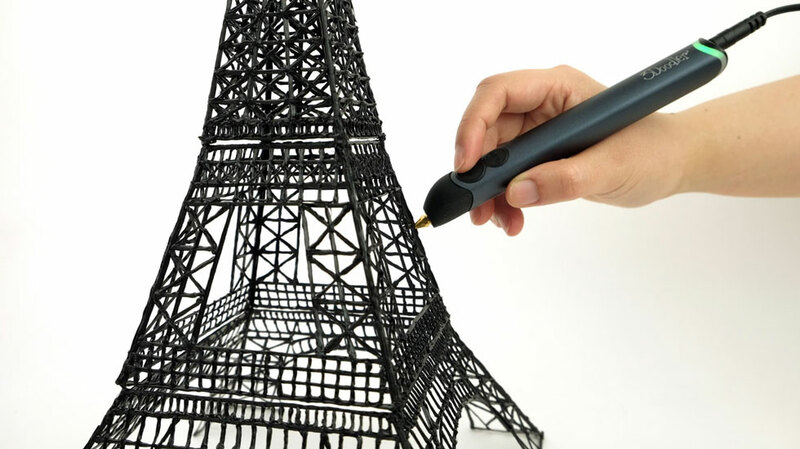 With Scribbler 3D Pen you can enjoy drawing activity especially, this gives extrusion speed. Scribbler 3D printing pen is ideal for both kids and adults; in general this pen come with 3 loops of plastic filament with this you can easily change the temperature control. This pen available with six speeds with this you can easily make adjustments based on your style of writing. In addition, the large screen makes it very easy for someone. AtmosFlare 3D pen is one of the perfect choices for the people who are interested in the 3d printing. This pen highly allows you to create miniature 3D art virtually in the air. Of course, this pen uses sticky ink that also cures instantly by the powerful UV light, this light will be emanating from the 3D pen’s tip. Even this pen also allows you to mix the different colors contained in ink cartridges. So it is the unique and futuristic drawing pen that help to building sculptures as well as this pen also enables you brings ideas to life. Apart from that this pen comes with fast turnaround time that also exquisite result. Obviously, it is the great tool in art class even it can be used in homeschooling. The ink also dries up fast that also enabling you to draw fast. This 3D pen and refilling cartridges are also available at pleasing rates. The MYNT 3D Printing Pen helps you to draw something into materialization. In general, the MYNT 3d pen delivers awesome result, it is ideal for the people who expect great quality. This 3d printing pen available with notable features, first of all people uses this pen for its extrusion speed control, this will enables you to have control over piece comes out. You have chances to dictate the speed as well as it helps to make complete process as much easy. This pen also features clear OLED display that also displays crystal clear information. Adjustable temperature settings offer ultimate comfort to the user. The adjustable temperature is ranging from 130 degrees to 240 degrees as well as it has 10 watts output power and an input of 5 volts/DC 2A so it is ideal for the outdoor usage. The Lightweight and ergonomically design also enhances your comfort level at the same time if help to focus on harnessing your creativity. There are different ranges of 3d printing pens available in the market, so you can prefer the best 3d printing pen according to your drawing style and needs. Before going to choose the 3d printing pen you must take the online reviews, it is important to choose best pen to make 3D drawings in empty space.